INSHORE – Local morning trips are doing well for Rockfish (Rockfish, Black & Rockfish, Brown & Rockfish, Blue & Rockfish, Copper & Rockfish, Vermillion & Rockfish, Yellowtail & Rockfish, Olive & Rockfish, Starry & Rockfish, Widow) and the numbers are steady. Afternoon trips are a bit tougher for good numbers. Squid is generally your best bet on a metal jig. Send it down to rocky bottom to find them. Sculpin (Scorpionfish, California) are also turning up on shallower, rocky bottom. Sand Bass (Bass, Barred Sand) are scattered but can be caught on live Sardine or Anchovy. OFFSHORE – We continue to see great catches from offshore boats into this week. Overnight trips are taking in good numbers of Bluefin (Tuna, Bluefin) along with limits of Yellowtail as well. Iron jigs suspended above bottom are a good choice. Three quarter day trips are catching the same fish. INSHORE – Heading farther offshore this week on a three quarter day trip we are seeing great numbers of both Bluefin (Tuna, Bluefin) and Yellowtail. Fish up to 100 pounds have been sighted so be prepared for a big catch. Flat Fall, coltsniper jigs and fluorocarbon line is your best setup. Over the next few days anglers will be targeting them on overnight trips. The half day trips continue to hook Rockfish (Rockfish, Black & Rockfish, Brown & Rockfish, Blue & Rockfish, Copper & Rockfish, Vermillion & Rockfish, Yellowtail & Rockfish, Olive & Rockfish, Starry & Rockfish, Widow) over structured bottoms. The afternoon bite has been more productive and the number of Reds is steadily increasing. INSHORE – There are still some decent Rockfish (Rockfish, Black & Rockfish, Brown & Rockfish, Blue & Rockfish, Olive & Rockfish, Starry) can still be found on nearshore structures this week. Sending Squid to the bottom is usually your best bet to hook them. Sculpin (Scorpionfish, California) can be found in the same areas with shallower water.The evening trips have been the most productive so far with many anglers also loading up on Bass (Bass, Calico) using Sardine or Anchovy. OFFSHORE – For offshore trips this week, it has been no surprise that Rockfish (Rockfish, Black & Rockfish, Brown & Rockfish, Blue & Rockfish, Copper & Rockfish, Vermillion & Rockfish, Yellowtail & Rockfish, Olive & Rockfish, Starry & Rockfish, Widow) have been the main target for offshore anglers heading to the Coronados. The numbers are decent and even a few Lingcod have made an appearance. Squid on the bottom is always the key on a three quarter day trip. Bonito (Bonito, Pacific) are just beginning to show up on irons. INSHORE – There is a nice variety for inshore and surf anglers this week. The morning bite has produced Bass (Bass, Calico & Bass, Barred Sand & Bass, Spotted Sand) throughout warmer areas of water with plenty of kelp for them to hide. Sardine or Anchovy are great baits to throw, and alternatively a swimbait is generally an artificial preference. In the shallower, rocky areas there have also been a good number of Sculpin (Scorpionfish, California) turning up as well. OFFSHORE – As Spring quickly approaches we are seeing more and more fish turn up. Rockfish (Rockfish, Black & Rockfish, Brown & Rockfish, Blue & Rockfish, Copper & Rockfish, Vermillion & Rockfish, Yellowtail & Rockfish, Olive & Rockfish, Starry & Rockfish, Widow) are steadily increasing into this week. Limits have been hit and sizes are decent. Squid on a metal jig sent right down to rocky bottom is your best bet on a day trip. Not many Lingcod have been brought in just yet however we expect this to fire up a little closer to the beginning of Spring. Both morning and afternoon trips are totalling decent numbers of fish. A handful of Yellowtail are also being brought in using Iron jigs and Mackerel. INSHORE – Closer inside the evening trips have been hooking Perch (Surfperch, Barred) in the sandy, shallow areas. They generally prefer Bloodworms, Lugworms or Gulp worms. Sculpin (Scorpionfish, California) are also being caught on rocky bottoms. Bass (Bass, Calico) have been a bit scattered however if you are putting time in you will find a few taking Anchovy, Sardines or Swimbaits in kelpy areas. OFFSHORE – This week the day and a half trips to Colonet have been quite productive. We are seeing steady catches of Yellowtail along with limits of Rockfish (Rockfish, Black & Rockfish, Brown & Rockfish, Blue & Rockfish, Copper & Rockfish, Vermillion & Rockfish, Yellowtail & Rockfish, Olive & Rockfish, Starry & Rockfish, Widow) turning up. Deep dropping to the bottom using cut Squid on a metal jig is your best bet over rocky bottomed areas. The Yellowtail prefer iron jigs suspended above the bottom. OFFSHORE – Rockfish (Rockfish, Black & Rockfish, Brown & Rockfish, Blue & Rockfish, Copper & Rockfish, Vermillion & Rockfish, Yellowtail & Rockfish, Olive & Rockfish, Starry & Rockfish, Widow) are open and on fire this week! The morning trip saw steady numbers along with a few Lingcod, Sculpin (Scorpionfish, California) and Sand Bass (Bass, Spotted Sand). Anglers are fishing structure using weighted jigs tipped with cut Squid. The evening trips are producing equally good numbers of Rockfish, Sculpin and even a few Calicos (Bass, Calico), Sheepshead and Sea Bass, White. They are also holding up on structure, but generally in a bit shallower water. Prior to Rockfish opener anglers headed out to Colonet on a day and a half trip for outstanding numbers of Yellowtail and Bonito (Bonito, Pacific). The Yellowtail can generally be caught on iron jigs. We hope to see this bite continue and improve as the season progresses. INSHORE – As you may have guessed, whether this week has kept anglers off the water. Dangerous conditions have shut down the coastline for miles so there hasn’t been a lot to report. Prior to these conditions Anglers were staying mostly inshore targeting Bass (Bass, Calico) and Sculpin (Scorpionfish, California). The Bass were hanging out in the kelpy areas as usual. There were some Sand Bass (Bass, Spotted Sand) to be caught on the flats as well. Bonito (Bonito, Pacific) and Halibut (Halibut, California) have been scattered. Along the shore there were plenty of Sanddab (Sanddab, Pacific). OFFSHORE – Prior to the recent weather anglers were heading towards the Coronado Islands to fish Lingcod, Yellowtail , Sheepshead along with a variety of Rockfish (Rockfish, Blue & Rockfish, Black & Rockfish, Vermillion & Rockfish, Copper & Rockfish, Brown). We hope to see this continue when the conditions are more favorable. INSHORE – Spotted Bay Bass (Bass, Spotted Sand) are in the lagoons. The sizes are great. Halibut (Halibut, California) are moving in as well. They are moving in for the spawn. OFFSHORE – Yellowtail were still biting off La Jolla when the last few boats were able to make it out. INSHORE – The beach has been producing short Halibut (Halibut, California) between the rains. There hasn’t been any legal sizes yet. Off the beach in the kelp area we are finding Sand Bass (Bass, Spotted Sand) on the artificial reef. Sanddab (Sanddab, Pacific) and Sculpin (Scorpionfish, California) are mixed in. OFFSHORE – Yellowtail are popping up in La Jolla taking surface irons when you can get out. INSHORE – Big Croaker can be caught this week. Barred Perch (Surfperch, Barred) are also turning up from the surf. The water temperature is nice so far. Shrimp is doing well to hook them. INSHORE – This week has been a bit tough to get offshore so far. The half day trip is producing Sanddab (Sanddab, Pacific) in good numbers along with a handful of Sculpin (Scorpionfish, California). The Sculpin have been found over hard bottom and structure using live bait. Sanddab are generally holding up on softer, sandier bottoms in shallow water. The numbers are consistent so far. Earlier in the week anglers were finding steady Bass (Bass, Calico & Bass, Spotted Sand) however they are a bit scattered. We hope to see them increase through the weekend. INSHORE – The beaches are fairly messed up with the recent storm. There hasn’t been a lot going on. Before the storm the Spotted Bay Bass (Bass, Spotted Sand) and Halibut (Halibut, California) were decent in the lagoons. OFFSHORE – Before the rain, the Yellowtail bite was great around Collenette and the Coronado Islands. We hope to see the weather break for anglers to get out and fish. INSHORE – Hey anglers! In order to bring you valuable, up to date content such as regulations, GPS Hotspots, and BRAND NEW features the Pro Angler App Pro Reports will be returning the week of January 16, 2017. Please feel free to take a look at last week’s reports for an idea of what’s biting or give your favorite local bait shop a shout! The Pro Angler App looks forward to bringing you lots of exciting changes as we kick off 2017! INSHORE – Closer to shore the Surfperch (Surfperch, Barred) is picking up from the beach. Anglers are surprisingly finding Corbina already. Halibut (Halibut, California) are moving into the lagoons and bays. Lucky Craft Lures or Anchovy are working well to hook them. Yellowtail are around La Hoya in the kelp beds. Sculpin (Scorpionfish, California) fishing has been great recently along with Kelp Bass and Sand Bass (Bass, Spotted Sand & Bass, Calico). For a January, the fishing is great. OFFSHORE – The Tanner Bank was producing Tuna however no one has headed out there recently to see if they’re still there. INSHORE – This week the half day trips are producing a mixed bag of fish. We are beginning to see the Rockfish (Rockfish, Vermillion & Rockfish, Copper & Rockfish, Olive & Rockfish, Brown & Rockfish, Blue) slow down a bit. They continue to take Squid Strips or Anchovy on a metal jig. Search for them on the bottom where there is structure. A few Boccaccio have been hooked as well. Around the sandier areas inshore we are finding a few Sanddab (Sanddab, Pacific) along with Sculpin (Scorpionfish, California) on structure. We expect this to forecast into the holiday week. The Pro Angler Team wishes you a Merry Christmas and Happy Holidays. We look forward to bringing you more great reports in 2017! OFFSHORE – Captain Justin Fleck called in this morning from the Excel out of Fisherman’s Landing in San Diego, CA. We have spent the past few days fishing at the Ridge. We had excellent fishing on school-sized Tuna (Tuna, Yellowfin), a few Wahoo mixed in, some Yellowtail and Grouper too!. The water is around 70 degrees so the exotics are still around. We are heading to the Lower Bank to fish for cows. We will check in tomorrow and let you know if we any success on the bigger ones! INSHORE – From the surf we are finding Perch and Sanddab (Sanddab, Pacific) The three quarter day trips to Catalina are producing a few Sand Bass (Bass, Spotted Sand) and Calicos (Bass, Calico). They are mostly being caught on live Anchovy and Sardine. Alternatively, Swim baits are working well. Sheepshead (Sheepshead, California) are holding up on nearshore structure. They prefer Crab or Squid. The Rockfish (Rockfish, Copper & Rockfish, Vermillion & Rockfish, Starry & Rockfish, Brown & Rockfish, Black & Rockfish, Olive & Lingcod) bite has been steady into this week. We are seeing great numbers and sizes on stripped Squid hooked on metal jigs. You can find them over rocky bottom. You’ll have to sink your setup right down to the bottom to hook them. Bocaccio are mixed in. INSHORE – Recently, Halibut (Halibut, Pacific) are the main target. Anglers are fishing them from the beach. They are finally legal size. The MPA that is open to shore fishing is the best places to be. Black’s Beach to Ponto Beach in Carlsbad has been producing lots of legal fish. Squid is the best producing bait while Kastmasters and Crocodiles are great artificials. An hour and a half on either side of the high tide is the best time to fish. OFFSHORE – Bluefin (Tuna, Bluefin) are still biting at Tanner Bank. The charters are taking mostly overnight trips when at all possible. Live Squid is best to hook them. Glow in the dark egg sinkers right on top of the hook will help. Rig 150 lb line on a 5/O to 8/O hook. Rockfish (Rockfish, Vermillion & Rockfish, Copper & Rockfish, Black & Rockfish, Brown & Rockfish, Blue) are also turning up on three quarter and half day trips. Most anglers are catching Rockfish on Squid. INSHORE – Closer to shore the half day trip is producing decent numbers of Sanddab (Sanddab, Pacific) and Sculpin (Scorpionfish, California). On rocky structure we are finding Sheepshead (Sheepshead, California) and Rockfish (Rockfish, Black & Rockfish, Brown & Rockfish, Vermillion) along with a few Boccaccio. They love Squid on a metal jig. Numbers are fair into this week. OFFSHORE – The day and a half trip for Tuna (Tuna, Bluefin) has been productive this week. Anglers are using feathers or plugs to find them. The numbers are outstanding so far and has been the focus for offshore anglers. INSHORE – On the half day we are seeing mainly Bass (Bass, Calico) and Rockfish. Recently we are seeing great numbers of Rockfish (Rockfish, Black & Rockfish, Brown & Rockfish, Olive & Rockfish, Blue & Rockfish, Vermillion) with plenty of Vermillion and a few Bocaccio and Sanddab (Sanddab, Pacific). Sardines and Anchovy are your best bet dropped on the bottom.Some anglers are targeting Surfperch (Surfperch, Barred) off the shore and piers. OFFSHORE – We are seeing day and a half trips out for Tuna (Tuna, Bluefin & Tuna, Yellowfin) at the Tanner Banks. The Bluefin are consistent. Pull up, chum and jig to hook them. The best bite has been throughout the day. BAIT REPORT – The bait barge is holding Squid, live Sardine and Anchovy. INSHORE – The half day trip has been catching plenty of Sanddab (Sanddab, Pacific). They can be found in shallow water through soft bottom areas. Calicos (Bass, Calico) are hit or miss. Your best bet is to throw live bait such as Anchovy or Sardine. Search the kelpy areas to find them. On the warmer days they will generally hold up in deeper water. The morning has been the best time to fish for them. OFFSHORE – The overnight trips to the offshore on the day and a half trips are catching Bluefin (Tuna, Bluefin) and Yellowfin (Tuna, Yellowfin). Generally, trolling with feathers or plugs will do well to hook them. There hasn’t been many reports on Rockfish this week. INSHORE – Anglers are half day fishing for an exceptional Rockfish bite. The numbers are great. We are starting to see a lot of Red Rockfish (Rockfish, Vermillion) turning up. Squid and Anchovy are your best bet to catch them inshore. Spotted Bay Bass (Bass, Spotted Sand), Sand Bass (Bass, Calico) and Halibut (Halibut, Pacific) are turning up on the reaction bite in the bay. They can be caught right from shore. Crankbaits and plastics are popular. Anglers fishing from Mission Bay in all the basins for Bass. OFFSHORE – There were new schools of fish that boats are heading to this week. We are seeing nice sizes of Yellowfin (Tuna, Yellowfin) that aren’t too far out. They are up to 40 lbs still. Tuna can be caught using live bait. BAIT REPORT – Sardines, Mackerel and Anchovy can be caught into this week. INSHORE – The Halibut (Halibut, Pacific) fishing has been good along the coast on Lucky Crafts. The lagoons are good too. Yellowtail are swimming the jetty around the Encinitas Power Plant. OFFSHORE – Tuna (Tuna, Yellowfin) are going crazy around the San Clemente Island. Anglers are live baiting for them around bird schools. Sardines are best to hook them. INSHORE – It’s been a tough go getting on the water this week. Most anglers are staying fairly close in for the most part when they can hit the water. We are seeing a decent catch of Sanddab (Sanddab, Pacific) along with scattered Bass (Bass, Spotted Sand & Bass, Calico). Search for the Bass in the soft bottom, kelp areas. They will be hiding in the cooler and deeper pockets. Generally live Anchovy or Sardine will hook them. A few inshore Rockfish (Rockfish, Olive & Rockfish, Copper & Rockfish, Blue & Rockfish, Brown & Rockfish, Black & Rockfish, Vermillion) have also been caught using Squid on a jig. Search structured areas to find them. INSHORE – This week, anglers are staying a bit closer to shore. There are some Calicos (Bass, Calico) being caught in the kelp areas. Many of the Bass are being released. Generally, Anchovy and Sardine will do well to hook them. We are also seeing Sheepshead (Sheepshead, California) on structure. Crabs or Shrimp are great baits to throw. There are also some Rockfish (Rockfish, Olive & Rockfish, Copper & Rockfish, Blue & Rockfish, Brown & Rockfish, Black & Rockfish, Vermillion) swimming rocky bottom. Metal jigs tipped with Squid will work well. INSHORE – The Bass (Bass, Calico) bite has been productive this week on live Sardine or Anchovy if you can get your hands on them. Sand Bass (Bass, Spotted Sand) and Mackerel are turning up inshore. A lot of the Bass are not keepers. OFFSHORE – The Yellowtail bite has slowed down a bit but it is still consistent. A few Bluefin (Tuna, Bluefin) to 85 lbs. They generally love feathers and plugs on the troll. Bonito (Bonito, Pacific) are scattered. Shiny lures will help to find them. INSHORE – Inshore there have been some Bass (Bass, Calico) caught in the kelpy areas on Anchovy or Sardine. Swim baits are a great artificial alternative. Sand Bass (Bass, Spotted Sand) have also turned up. Yellowtail are scattered. They are taking live Crabs. A few inshore Rockfish (Rockfish, Blue & Rockfish, Brown & Rockfish, Black) have been hooked on rocky bottom as well. OFFSHORE – Anglers heading far into the offshore are taking day and a half trips to search for Tuna (Tuna, Bluefin & Tuna, Yellowfin). They can be caught on plugs or feathers. INSHORE – This week, many anglers are staying closer to the inshore on half day trips. The Bass (Calico, Bass) bite has been consistent but not hot. Anglers can use Anchovy or Sardine to find them in the kelpy areas. Search shady places with cooler water to find them. Swimming baits are also a great alternative. The Rockfish (Rockfish, Olive & Rockfish, Copper & Rockfish, Blue & Rockfish, Brown & Rockfish, Black & Rockfish, Vermillion) gave slowed down quite a bit. Metal jigs will hook them from the structured bottom. Tip your hook with Squid to attract them. The Mackerel (Mackerel, Pacific) bite has been on fire this week. We are seeing outstanding numbers and varied sizes. A few Sheepshead (Sheepshead, California) have also turned up on structure. OFFSHORE – Those who have made it offshore this week have caught a few Yellowfin (Tuna, Yellowfin) however they are a bit farther out. Troll plugs or feathers to find them. INSHORE – The half day trip is producing a decent amount of Rockfish (Rockfish, Olive & Rockfish, Copper & Rockfish, Blue & Rockfish, Brown & Rockfish, Black & Rockfish, Vermillion) this week. The numbers aren’t exactly hot however they are consistent. Calicos (Bass, Calico) and Sand Bass (Bass, Spotted Sand) have been caught and released as well. They are taking Sardine and Anchovy. Sheepshead are hit or miss on structure along with Sculpin (Scorpionfish, California). INSHORE – Inshore we are still waiting for the Calico bite (Bass, Calico) to heat up. They are biting consistently however most of the fish are short. There were some Sand Bass (Bass, Spotted Sand) released as well. Generally live bait such as Sardines or Anchovy is a good choice to attract the bigger fish. Search the kelp or grassy flats to find them. There are a few Sheepshead being caught on structure as well. OFFSHORE – The Rockfish (Rockfish, Olive & Rockfish, Copper & Rockfish, Blue & Rockfish, Brown & Rockfish, Black & Rockfish, Vermillion) bite has continued into this week. They have been turning up fairly steadily. The numbers aren’t off the charts however if you are targeting them and put some time in you’ll have a few good fish using a Bucktails or Scampi Tails. Live bait will be a bit more attractive if the fish are scattered. They aren’t picky so just about any small baitfish will work. Strips of Squid work particularly well. INSHORE – The half day trip has produced a few Rockfish (Rockfish, Blue & Rockfish, Black & Rockfish, Olive & Rockfish, Brown & Rockfish, Vermillion). The bite has been slow. Iron jigs tipped with Squid will be a good choice. INSHORE – The half day trip has been the most productive for Calicos (Bass, Calico) on swim baits. If you are searching with live bait, Anchovy is always a great choice. There are still more Bass being released than keepers. Sheepshead have been holding up on structure. Sculpin (Scorpionfish, California) can always be found over rocky bottom. OFFSHORE – Bluefin (Tuna, Bluefin) are up to 100 lbs this week. We are also seeing Yellowfin Tuna (Tuna, Yellowfin) up to 90 lbs. Rockfish (Rockfish, Black & Rockfish, Brown & Rockfish, Vermillion & Rockfish, Olive & Rockfish, Blue) are scattered however if you put some time in you should get a few decent numbers. INSHORE – The Calicos (Bass, Calico) have been doing really well so far. We are seeing solid numbers, especially when using live bait such as Anchovy and Sardine. There are also some Bonito (Bonito, Pacific) swimming the inshore on structured bottom. Sabiki them up from piers or catch them on shiny lures from the inshore. OFFSHORE – The three quarter day trip has been most productive this week. Yellowtail are consistently biting around Catalina Island and San Clemente Island. The numbers are great so far. Anglers can thrown Iron jigs tipped with Squid for a good bite. Farther out there have been a few Yellowfin (Tuna, Yellowfin) caught however they are scattered and you’ll have to put some time in to find them. Trolling plugs or skirted lures will help cover some ground. INSHORE – The Bass (Bass, Calico) bite is consistent into this week. We are seeing decent numbers come up this week and the size are varied. Since they are a bit thinner a live bait such as Sardines or Anchovy will do well to hook them. Inshore, the Bonito (Bonito, Pacific) are swimming. There are also Barracuda (Barracuda, California) on the reefs. OFFSHORE – On a three quarter day trip toward Catalina Island we have found a decent amount of Yellowtail so far. There have also been a few slim catches of Rockfish (Rockfish, Blue & Rockfish, Olive & Rockfish, Brown & Rockfish, Vermillion & Rockfish, Copper). They are slowing down a bit. INSHORE – The action is a bit more lively inshore this week. We are seeing a handful of Bass (Bass, Calico) turning up from the structured areas and weedlines. There are more being released than kept. The sizes are fair and they are taking metal jigs, soft plastics or Sardines. There are also a few Sheepshead in the same areas. Watch out for the Barracuda (Barracuda, California) that may break your line!The open water is holding some Bonito (Bonito, Pacific). OFFSHORE – The Yellowtail bite seems to have dropped off a bit this week. There were very few catches turning up lately, even on the three quarter day trip. Rockfish (Rockfish, Blue & Rockfish, Olive & Rockfish, Vermillion & Rockfish, Copper & Rockfish, Black) are scattered. The bite is a bit tougher than last week. Use iron jigs to get right down to the bottom and hook them. INSHORE – Yellowfin (Tuna, Yellowfin) are within 2 miles of the coast this week. There are Bluefin (Tuna, Bluefin) that are mixed in up to 4 miles out. Anglers are using poppers to hook them. The Cold Sniper and Starman Surface Iron are working well. This has been the main focus for most anglers. They are up to 240 lbs. The surf fishing is great. Croaker are good and the Corbina are moving in. Bloodworms, Mussels and Sand Crabs are best on the surf. The lagoon is producing Bay Bass (Bass, Spotted Sand), Calicos (Bass, Calico) and Halibut (Halibut, Pacific). Bait, frozen Anchovies, Bloodworms and a variety of swim baits will hook them. Don’t miss the Corbina Fishing Derby during the month of August, sponsored by Cousin’s Rods! INSHORE – There has been a nice mixed bag of fish caught this week. The Rockfish (Rockfish, Black & Rockfish, Brown & Rockfish, Blue) are biting a bit closer to shore so far. Diamond jigs tend to do better in the shallower water. The Calicos (Bass, Calico) are increasing in both sizes and number. While plenty are still being release we have had more keepers turn up on swimbaits. A handful of Sheepshead are sticking to the structure. Bonito (Bonito, Pacific) can be found scattered throughout the nearshore. OFFSHORE – This week we are seeing charters heading all over the place. Anyone making the 1.5 day trip out for Tuna (Tuna, Yellowfin) and Dorado are finding quite a bite of success this week. The sizes are varied however the numbers are great. Trolling plugs and feathers has been very productive. There have also been some Yellowtail caught during the trip as well. A bit closer in the Rockfish (Rockfish, Black & Rockfish, Brown & Rockfish, Blue & Rockfish, Vermillion & Rockfish, Olive & Rockfish, Copper) continue to bite although we aren’t seeing numbers as consistent as last week. INSHORE – This week we have seen anglers sticking to a half day trip. The Calico Bass (Bass, Calico) bite continues on Sardines and Swim baits in Sardine colors. There were more released than caught so far. Mackerel (Mackerel, Pacific) are beginning to make an appearance however we have not seen a consistent day to day bite. Several Barracuda (Barracuda, California) were also released. A few Sheepshead have turned up on structure. The Rockfish (Rockfish, Black & Rockfish, Brown & Rockfish, Blue) bite has slowed down a bit this week. If you are targeting them you can use metal jigs, plastic lures or Sardines if you prefer live bait. INSHORE – Staying closer to shore anglers are reporting a great Calico (Bass, Calico) bite throughout the kelp areas. There were plenty of Bass released as well. The Sand Bass (Bass, Spotted Sand) numbers have not yet heated up at this point but there are swimming for anglers putting their time in. Search the sandy flats and soft areas for them. Sculpin (Scorpionfish, California) are always biting over the rocky areas. There have also been some Rockfish (Rockfish, Black & Rockfish, Brown & Rockfish, Blue) caught from the nearshore over structure as well. OFFSHORE – On the three quarter day trip anglers are finding a great catch of Rockfish (Rockfish, Copper & Rockfish, Vermillion & Rockfish, Black) in consistent numbers so far. Going farther out to the overnight trips the Yellowtail continue to beite well this week. There have been a few Bonito (Bonito, Pacific) brought into the boat. The Yellowfin (Tuna, Yellowfin) bite is just beginning to heat up and we are seeing our first good numbers this week. OFFSHORE – The varieties of Rockfish (Rockfish, Greenspotted & Rockfish, Black & Rockfish, Olive & Rockfish, Blue & Bocaccio) continue to bite steadily into this week. We are also seeing good numbers of Red Rockfish (Rockfish, Vermillion) turn up as well. Bonito (Bonito, Pacific) have also started to come in. This was on a half day trip. Farther out we are seeing Tuna (Tuna, Bluefin) and a nice bag of Yellowtail in good numbers. INSHORE – Inshore the Calicos (Bass, Calico) are being caught throughout the grassy and kelp flats. We are seeing decent sizes however you will have to put some time in to find them. Sanddab (Sanddab, Pacific) have also continued to turn up this week. They are swimming over soft bottom and the numbers are steady. OFFSHORE – The bite continues to be consistent into this week. Great numbers of Red Rockfish (Rockfish, Vermillion) and plenty of Coppers (Rockfish, Copper) have turned up. There is a nice variety of Rockfish (Rockfish, Greenspotted & Rockfish, Black & Rockfish, Olive & Rockfish, Blue & Bocaccio) have also been biting. INSHORE – Things are beginning to pick up inshore. Although the Sheepshead bite is not hot, they are out there for anglers targeting them. The Calicos (Bass, Calico) have been increasing nicely in both sizes and numbers. They can be found throughout the kelp and grassy areas. The Sand Bass (Bass, Spotted Sand) have also been coming in pretty consistently. The numbers are not quite off the charts but they are doing well for the time of year. Sculpin (Scorpionfish, California) are always around so if you are looking for a guaranteed catch search the rocky areas to find them. OFFSHORE – This week we are not seeing a whole lot of action from the offshore. The Rockfish (Rockfish, Vermillion & Rockfish, Greenspotted & Rockfish, Black & Rockfish, Olive & Rockfish, Blue & Rockfish, Copper) bite has dropped off quite noticeably. If you put some time in you should be in for a few solid catches. There has also been a few Sharks (Shark, Shortfin Mako) hooked over the past week. They are not consistent but put up a good fight when anglers are reeling them in. Most anglers are heading out for the half to three quarter day trip this week. We hope to see things pick up for the weekend. INSHORE – Over the past week we have seen a nice variety of fish coming in. Sculpin (Scorpionfish, California) have been hitting from the rocky areas. The Sand Bass (Bass, Spotted Sand) and Calicos (Bass, Calico) have been steadily increasing. We are seeing solid numbers coming from the grassy areas and throughout the kelp. Going towards the nearshore we are beginning to see great numbers of Yellowtail. We hope to see this continue into the weekend. OFFSHORE – The Rockfishing (Rockfish, Vermillion & Rockfish, Greenspotted & Rockfish, Black & Rockfish, Olive & Rockfish, Blue & Rockfish, Copper) has been hit and miss. They haven’t been on fire this week but they are still there for anglers targeting them. A few Whitefish have been caught as well, but they are not consistent. Even a few Sea Bass (Sea Bass, White) have turned up but they are not consistent either. INSHORE – From the inshore, the Sanddab (Sanddab, Pacific) have steady numbers and seem to be a go to if nothing else is biting. A few Sand Bass (Bass, Spotted Sand) and Sheepshead have also be hooked however they are nowhere near consistent yet. OFFSHORE – Anglers are heading out of three quarter day trips this week. The Red Rockfish (Rockfish, Vermillion) count has been outstanding so far. The Coppers (Rockfish, Copper) and Bocaccio have also been catching well. We are seeing a nice variety of other Rockfish (Rockfish, Greenspotted & Rockfish, Black & Rockfish, Starry & Rockfish, Blue) being caught but they don’t seem to have lit up yet. INSHORE – The main bite inshore has been the Sanddabs (Sanddab, Pacific). We have not received any reports of Bass (Bass, Calico & Bass, Striped) turning up over the past few days. We hope to see this increase for the coming weekend along with the Halibut (Halibut, Pacific) bite. OFFSHORE – We are finally seeing some action from the offshore this week. The Vermillions (Rockfish, Vermillion) are increasing nicely both in size and bite. We are seeing some great fish come up. Other various Rockfish (Rockfish, Black & Rockfish, Starry & Bocaccio & Rockfish, Copper) have also turned up. INSHORE – The Rockfish (Rockfish, Black & Rockfish, Starry & Rockfish, Copper) numbers have been a bit scattered so far this week. We are seeing a nice variety of fish however. Sheepshead have been steady along with Sanddab (Sanddab, Pacific). Calico Bass (Bass, Calico) and Sand Bass (Bass, Spotted Sand) have also been reported however we are still waiting for those numbers to heat up. INSHORE – Things are a bit scattered inshore this week. We are seeing a few different fish but none of them seem to be consistent. Sand Bass (Bass, Spotted Sand), Calicos (Bass, Calico) and Sculpin (Scorpionfish, California) have been reported this week. There have also been a few Sheepshead caught from the structured areas. OFFSHORE – The rockfish (Rockfish, Vermillion & Rockfish, Black & Rockfish, Starry & Bocaccio & Rockfish, Copper) continue to bite this week. We are seeing a great variety so far and the sizes seem to be mixed. The numbers aren’t as hot at this point but they will heat up as the season progresses. A few Ocean Whitefish have made their way into boats as well. We expect this bite to continue into the weekend. INSHORE – The inshore bite has been productive, especially on the half day drip. Sand Bass (Bass, Spotted Sand) and Calicos (Bass, Calico) continue to swim. The sizes are varied and the bite is consistent. Search the grassy areas to find them. A few Sheepshead (Sheepshead, California) are still holding up on rocky areas. On the deeper nearshore rocks we are seeing some Treefish turn up as well. OFFSHORE – The rockfish (Rockfish, Vermillion & Rockfish, Black & Rockfish, Starry & Bocaccio & Rockfish, Copper) are beginning to heat up on the half day trip. A handful of Triggerfish (Triggerfish, Gray) have been caught farther out as well. We continue to see the most action inshore as of this week. INSHORE – On the half day trip we are beginning to see the Sculpin (Scorpionfish, California) bite slow down. They are still present for anglers who are targeting them however they are scattered about the rocks. Sand Bass (Bass, Spotted Sand) and Kelp Bass (Bass, Calico) are beginning to heat up in replacement. We are not seeing incredibly high numbers yet however they will increase as the season progresses. OFFSHORE – Farther out, the Rockfish (Rockfish, Copper & Rockfish, Vermillion & Rockfish, Black & Bocaccio) are beginning to bite. We are seeing consistent numbers, even on a half day trip. There are also some Yellowtail just starting to heat up. Whitefish are running thick so far and a few Bonito (Bonito, Pacific) have turned up as well. INSHORE – The half day trip has been very productive for anglers this week. We are seeing Bass (Bass, Calico) turn up throughout the inshore. Look for kelp and grassy areas to find them. The Sculpin have continued to bite so far. They are hanging out over rocky bottom and will generally take small live bait. OFFSHORE – There is some great action taking place offshore this week. Red Rockfish (Rockfish, Vermillion & Rockfish, Starry & Rockfish, Copper) are turning up in solid numbers. We are seeing various other Rockfish (Rockfish, Black & Rockfish, Brown & Rockfish, Bocaccio) as well. The sizes are average however we expect them to increase throughout the season. INSHORE – The Halibut (Halibut, Pacific) continue to bite this week. They are mainly in the lagoons and habor to spawn. We are also seeing Sea Bass (Sea Bass, White) and Yellowtail in the kelp beds. They can be found within a mile of the beach. They are consistent so far this week. Surfperch (Surfperch, Barred) are still hitting right on the beach. It is shaping up to be a great Summer! OFFSHORE – Everyone is focusing on the Bluefin Tuna (Tuna, Bluefin) this week. They are anywhere from 5-15 miles offshore. Yellowfin (Tuna, Yellowfin) are on the 60 mile bank which is the earliest ever for Yellowfin in California waters. INSHORE – Rock Cod (Rockfish, Starry) and Sculpin are the most productive fish inshore this week. Squid and live bait has worked best. Anglers are using a mix of Mackerel, Sardines and Anchovies. Bass (Bass, Calico & Bass, Spotted Sand) are turning up throughout the inshore as well. OFFSHORE – Bluefin (Tuna, Bluefin) are turning up offshore this week. We are just starting to see them show up on Cracker Dines. The Yellowtail has also been long range the last couple weeks. It’s a mixture of lures in red that are the most productive to hook them but they bite better on live bait if you can get your hands on some. INSHORE – The half day trip anglers are seeing a few catches of Bass (Bass, Calico & Bass, Barred Sand). This is a great sign of the Spring bite moving back in. The sizes are nothing crazy yet but we expect they will start to increase soon. There have been a great number of Perch (Surfperch, Barred) as well this week. We are even seeing some Rockfish (Rockfish, Black & Rockfish, Brown) closer in. OFFSHORE – Whitefish have been showing up throughout the offshore and the numbers are increasing. Sheepshead have been swimming structures. They’re not hot but if you put some time in you’ll find a few good sizes. Bass (Bass, Calico & Bass, Barred Sand) have also been caught in the offshore but they are few and far between. There are some decent numbers of Rockfish (Rockfish, Starry & Rockfish, Black & Rockfish, Copper) turning up as well. These fish have all been found on a three quarter day trip. INSHORE – Throughout the inshore the Sanddab (Sanddab, Pacific) bite continues to be steady this week. The numbers are consistent and we expect to see this continue into the weekend. OFFSHORE – Rockfish are hot in the area as of late. We are seeing some great numbers turn up and the sizes aren’t bad either. Most of them have been Vermillions (Rockfish, Vermillion) and Bocaccio (Rockfish, Bocaccio). There is a pretty good variety in the water. OFFSHORE – This week things are beginning to pick up. The Rockfish (Rockfish, Bocaccio & Rockfish, Red) are slowly returning for the Spring bite. There are also tons of Sanddab, Pacific swimming which are usually a never fail catch. Anglers are excited to see the Spring pattern move back in so check out our Fish feature which provides tons of tips and tricks to keep your lines tight. INSHORE – Things have been pretty slow. There are some Ray, Bat out at the end. Mackerel, Pacific showing up as well. They have been caught around the baitfish. There have also been reports of Sargo and Croaker, Spotfin a well. Anglers who put their time in should have no trouble hooking some fish at the pier. INSHORE – The Mackerel, Pacific are hot out back this week. There was also some Bass, Calico caught big enough to keep. 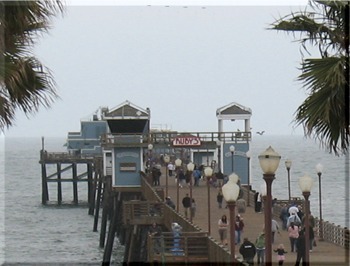 Anglers are catching them off the pier this week from half to all the way out. Sargo and Surfperch, Barred are hitting off the pier as well. They are loving Shrimp and it is doing well to catch them. INSHORE – The half day trip has been fairly productive for anglers this week. We are seeing a good amount of Sculpin turn up in decent numbers. They are not as hot as they have been in the past few weeks however they are also not the target for most anglers anyways. There are also a good amount of Sanddab, Pacific turning up however they, too have slowed down. Anglers are excited to have some Bass, Spotted Sand and Bass, Calico turning up throughout the inshore. They are finally starting to move back in with their Spring pattern. INSHORE – Things are beginning to heat up inshore this week. Tons of Sculpin continue to be hooked on a half day trip over rocky bottom. There are also a few Sanddab, Pacific swimming over soft bottom however the numbers are not even close to what they were a few weeks ago. We are beginning to see a spotty return of Bass (Bass, Calico & Bass, Spotted Sand). The numbers are low right now however they are increasing from week to week along with the sizes. There have also been some Sheepshead, California caught in the past few days that we expect to see continue into the weekend. Anglers are searching structure to find them. OFFSHORE – The past few days have not produced a lot of offshore action for anglers in this area. There are some various Rockfish being caught however they were released. They are fairly close in this week and boats will only need a half day trip to reel in roughly 50 decent fish. INSHORE – Sculpin continue to be predominant this week. On half day trips anglers are hooking double digits of them. Normally they are not the target due to their venomous nature however they are a populous fish for this time of year and are generally an easy catch as they swim close to the surface and can be easily sight fished. Lightweight topwater lures are the way to go for these fish. The Sanddab, Pacific bite has begun to slow down day by day. There is not a whole lot of action throughout the inshore however the Spring bite is quickly approaching so anglers are getting geared up. OFFSHORE – Although they are catch and release there are plenty of species of Rockfish (Rockfish, Vermilion, Rockfish, Brown & Rockfish, Black). The sizes are nothing huge but the bite has been consistent. Anyone looking to practice for the open season can certainly put some time in now. INSHORE – The numbers are beginning to slow down a bit this week. The Sanddab, Pacific bite has been in numbers less than 30 on a half day trip. Sculpin have been consistently around 60. The Sculpin are swimming fairly close to the surface so topwater and lightweight lures are working well to hook them. The Sanddabs can be found along sandy bottoms in shallow water. They will commonly hit just about anything including Shrimp, Clams or plastics. There are also a few Bass, Calico swimming this week. They are generally found holding up in kelp and grass. Jerk Shads and Swim baits are the best ways to hook them. INSHORE – Sculpin and Sanddab, Pacific have remained consistent over this week. The numbers have been great so far on only a half day trip. The sizes have been decent as well. The Sculpin are swimming fairly close to the surface so topwater and lightweight lures are working well to hook them. The Sanddabs can be found along sandy bottoms in shallow water. They will commonly hit just about anything including Shrimp, Clams or plastics. There are also a few Bass, Calico swimming this week. They are generally found holding up in kelp and grass. Jerk Shads and Swim baits are the best ways to hook them. OFFSHORE – We are seeing some great results from the offshore so far this week. Decent numbers of Bonito, Pacific are turning up along with some Yellowtail in the deeper water. The Yellowtail have been spotty however we expect to see results pick up by the weekend. INSHORE – Anglers have stayed fairly close to shore so far this week. On a half day trip we are seeing a great number of Sculpin as well as some Sanddab, Pacific. The Sculpin can be found swimming near the surface over structured bottoms. The Sanddabs are spotty and do not have a consistent bite so far. They are generally swimming the bottom of a sandy area with a lack of current. They’re not picky fish and will usually hit just about anything from Shrimp to anchovies. INSHORE – The main focus has been on the inshore this week as not too much is happening in the deeper water. There have been some good bites of Sculpin turning up in good numbers and sizes on a half day trip. Angler are also finding plenty of Sanddab, Pacific swimming as well. There have been no signs of Bass, Barred Sand so far this week however we hope to see some turn up by the weekend. INSHORE – The bite inshore has been the main focus of most anglers this week. There are good numbers of Bass, Barred Sand turning up along with plenty of Sanddab, Pacific too. California Scorpionfish have also made an appearance this week in great numbers. They should not be difficult to catch at all. These were caught on a half day trip. INSHORE – The bite throughout the inshore has remained consistent into this week. Anglers have reported Bass, Spotted Sand turning up in both good numbers and sizes. There have also been reports of Bass, Calico and Surfperch, Sand in the same areas. Their sizes are still fairly small but expected to grow quickly. There were also several Sculpin caught in the nearshore with some Rockfish (Rockfish, Vermillion & Lingcod) mixed in. OFFSHORE – Farther out this week there have been reports of both Sea Bass, White and Sea Bass, Giant so far. Their numbers are not on fire however we expect that anglers who put some time in should be able to reel in a fish or two on the offshore structure. These fish can be found on roughly a half day trip, not too far off the coast. INSHORE – There is still a great Bass, Calico biting in the closer water this week. Anglers have seen a spotty Bass, Spotted Sand turning up as well however most of the action is on the offshore so far however anglers can find these fish within 90 ft. of water at most. There is no sign so far of Mackerel, Pacific running yet this week however we expect to see lots in the water over the holidays. INSHORE – There’s still a good yellowtail bite on the inshore rockfish piles in about 200 ft of water. Dropper loop with mackerel is always a good choice along with heavy jigs. The tuna fishing has pretty well moved out. There’s also a decent Calico (Bass, Calico) bite around the inshore kelp. The Calico fishing has been excellent this year. A bunch of the kelp is now submerged a bit so you’ll have to put a little more time into finding good beds. Swim baits have been working well for them. OFFSHORE – There’s not a whole lot to report here this week offshore. BAIT REPORT – Mackerel are working well for Yellowtail. The buoys outside the jetties are great places to find them with a Sabiki rig. INSHORE – There are still Mackerel, Pacific coming in off the pier. They are on fire right now and anglers are bringing back bags of them. There have been some nice Croaker caught in the area as well. Sargo have shown up from the pier and even a small Shark, leopard came in at 3 ft long. Most guys are using cut mackerel for bait as there are tons of small sizes running. We have not had reports of any Bass, Calico in the area yet this week. OFFSHORE – There are still good sizes of Sea Bass, Black biting in the offshore however they are not legal to keep at this time so anglers are recreationally fishing them. There have been no signs of Tuna, Yellowfin so far this week. Otherwise the focus has been on the inshore so far this week. Anglers heading out this weekend can always check out our Tips feature for more information and suggestions to help improve the catch. BAIT REPORT – Baby Mackerel and Croaker are both swimming around the pier this week. Most people are jigging sabikis for Mackerel. INSHORE – Bass, Calico have been on fire in this area. They have been hitting just about everywhere on gulp and swim baits. Fly lining anchovies has been another productive method while working the kelp. Halibut, Pacific have also begun to show up and Yellowtail are beginning to move into 240 ft. They can be brought in on a dropper loop. There have not been any reports of Rockfish yet however our sources suspect they are still out there. OFFSHORE – There has been quite a bit of action on the offshore this week. The three quarter day boats have been heading out about 20 miles to score some Tuna, Yellowfin, Yellowtail, Skipjack and Dorado. Live Sardines have been the best bet to hook any of these and their sizes have varied quite a bit. The bite is expected to continue as long as the weather remains favorable. BAIT REPORT – There are no bait reported to be running so far this week. Keep an eye out for details on Pacific Coast Bait & Tackle’s Surf Tournaments beginning February 1st! INSHORE – There continues to be a solid Rockfish bite this week (Rockfish, Vermillion & Rockfish, Widow & Lingcod) anywhere from 180-250 ft. They are still hiding in the kelp at this point and have become more spotty than last week. There have been no reports of Bass, Calico this week but our sources suspect they are still out there at this point. The weather looks good for the upcoming weekend so the bite is anticipated to be great. OFFSHORE – There has not been a whole lot of action from the offshore. With the unfavorable weather last week the water still is not completely settled. There have been no reports so far this week however with the nice holiday weather coming our sources expect the bite to come in. Anglers heading out on the water can always check out our Tips feature which provides additional information and suggestions that can help improve the catch. BAIT REPORT – The Mackerel run is on fire again this week. Anglers are jigging them up on Sabiki rigs. INSHORE – Most anglers in this area have switched to Rockfish (Rockfish, Vermillion & Rockfish, Widow & Lingcod) are all biting well from 180-250 ft. Keep in mind the Sculpin are closed. Anglers are using strip Squid and letting it sink below the kelp. Bass, Calico are also swimming and biting Anchovies as the money bait. Small Sardines and plastics are working as well for both Rockfish and Bass.They are hiding in or way under the kelp as the water is still fairly warm. Some Yellowtail have been reported as well in several different areas along with some Bass, Barred Sand. OFFSHORE – The unfavorable weather this week has deterred anglers from getting out to the deeper water. There have been no offshore reports for the area this week. Anglers who decide to head out if the conditions become manageable can always consult our Tips feature which provides additional information and suggestions on how to improve your catch. Of course, the fine folks at Pacific Coast Bait & Tackle can always provide an up to the minute report as well. BAIT REPORT – There is a solid Mackerel run and the best time to catch is early morning on a Sabiki rod tipped with Squid. INSHORE – Things have been slow around here lately. The Halibut, Pacific bite continues to do well in this area reeling in sizes around 15”. Anglers are throwing Mussels or Squid on a hook right down to the bottom. Morning has produced the best results for catching Halibut. The Calico Bass have become spotty though. OFFSHORE – The unfavorable weather this week has deterred anglers from getting out to the deeper water. There have been no offshore reports for the area this week. Anglers who decide to head out if the conditions become manageable can always consult our Tips feature which provides additional information and suggestions on how to improve your catch. Of course, the fine folks Ocean Pier Bait Store can always provide an up to the minute report as well. BAIT REPORT – There are not bait running to report at this time. INSHORE – The Halibut, Pacific bite continues to do well from the lagoon. Calico Bass are hitting as well. Anchovies are the live bait choice although most anglers are throwing lures such as swimbaits or gulp baits and reporting greater success. The surf has been slow as there have been no reports of anything coming out. Weather conditions are expected to settle down this weekend giving anglers the opportunity to get out on the water. OFFSHORE – This week the weather has been less than ideal in this area. There have been no reports of anglers making their way out in the deep water. Therefore, if no one is fishing, no one is catching. Previously there were Wahoo caught between 2 and 8 miles out as well as some small patches of Tuna (Tuna, Yellowfin) and Skipjack. Anglers who are up for a longer trip can ride a day and half to the banks where there are bigger schools of Tuna to be caught. BAIT REPORT – Smelt are still hanging around and there are a few spotty Corvina in the lagoon, even one reported up to 7lbs!